[prMac.com] San Francisco, California - 128bit Technologies is happy to announce the release of 1000 OpenType Fonts, version 4.0 on its MacAppware website and the Mac App Store. The 4.0 release features new Webfont versions to the fonts in the popular 1000 OpenType Fonts collection, as well as something that has had a high volume of requests: a PDF sample book of all the font families so you can quickly reference the fonts you need for a specific project! Looking to give your font collection a boost? Tired of using the same fonts in all your design projects? 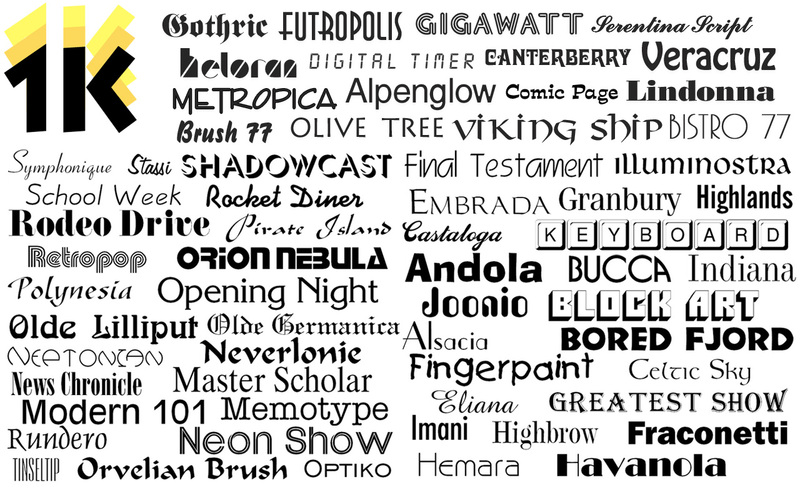 Need fonts you can use royalty free on commercial, for-profit projects? Get creative with a new collection of 1000 OpenType fonts for commercial use. The font collection includes 240 unique font family styles, with 1000 total fonts. An excellent addition to any font collector's library for use in graphic and logo design, holiday projects, web design, scrapbooks, presentations, invitations, promotional material, advertisements, and more. Each font in this collection is unique, so you will not find them anywhere else. This collection is completely different from the Premium Fonts and Free Fonts collections also offered by 128bit Technologies. The updated 1000 OpenType Fonts collection is now available on the Mac App Store and the MacAppware website for a limited time discount of $29.99 (USD), a savings of 70% off the full price of $99. MacAppware is a division of 128bit Technologies and a dedicated Mac software developer currently offering Mac software, graphic design bundles and unique commercial use fonts. Copyright (C) 2016 128bit Technologies LLC. All Rights Reserved. Apple, the Apple logo, Mac OS X, and Macintosh are registered trademarks of Apple Inc. in the U.S. and/or other countries. All other trademarks are the property of their respective owners.